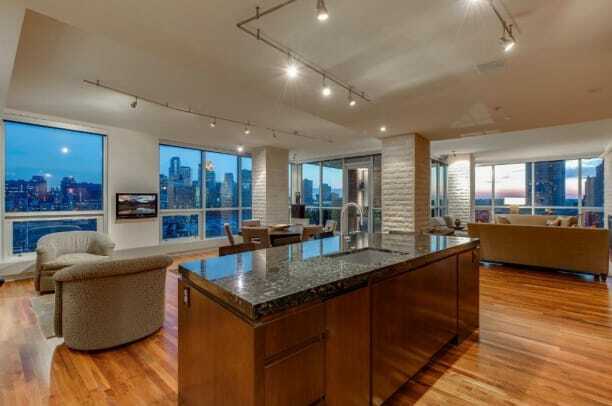 This condo in St. Anthony Main will set you back $2.2 million. The stunning skyline of downtown Minneapolis is one of many rewards for owners of this luxury condominium in St. Anthony Main. With a deck and a living space wrapped with full-length glass windows, the lucky owner of Apartment 901 at the Phoenix on the River building can enjoy the views all-year round. On the market for $2.2 million, the condo comes with 2,740 square feet that comprises 2+ beds, 3 baths and 3 parking spaces. It&apos;s designed by award-winning architect Thomas Whitcomb, thanks to whom the property is filled with "elaborate custom casework, hand selected stone, and professional grade appliances and countertops." The location is difficult to beat. Getting proximity to bustling city life but with a quieter ambience thanks to the natural barrier of the Mississippi River between downtown Minneapolis and St. Anthony Main. Residents are a short walk away from the restaurants and bars that line St. Anthony Main, as well as local trails and the the Stone Arch Bridge. Click here for more Minnesota Nice Homes. Condo owners meanwhile get access to a 24-hour staffed reception and waiting area, private conference and meeting rooms, a fully-equipped fitness center and at least 80 square feet of private resident storage. There&apos;s also access to a potting shed and workshop for home projects, and the heated parking ramp has controlled access and a car wash area. Cynthia Froid of the Cynthia Froid Group has the listing. She can be contacted at 612.279.8215 or by email cfroid@kw.com. Minnesota Nice Homes is a weekly feature by the Bring Me The News team, sharing cool and unusual homes on the market in Minnesota. You can find our other featured properties here. The French farmhouse-style home is on the market for $1.1 million. The 19th Century property was built for former St. Paul Archbishop John Ireland. Buy for the house, stay for the views. It can be yours for a cool $1.225 million. On the market for $549,000, its owners describe it as like a castle and a cabin.